The Aluminum Walking Stick - Version II from Novoflex has three sections, reaches a maximum height of 45.75" and weighs 0.75 lb. It has a contoured rubber handle with wrist strap. Under the handle is a 1/4"-20 stud. The walking stick may be converted to a monopod, and has a rubber tip at the bottom with a metal spike underneath. The second section has markings ranging from 110 to 150cm. This product may also be used with QuadroPod and TrioPod bases. A QuadroPod Monopod Plate is provided with this stick to convert it into a monopod. Box Dimensions (LxWxH) 28.2 x 4.0 x 3.7"
Aluminum Walking Stick - Version II is rated 5.0 out of 5 by 1. 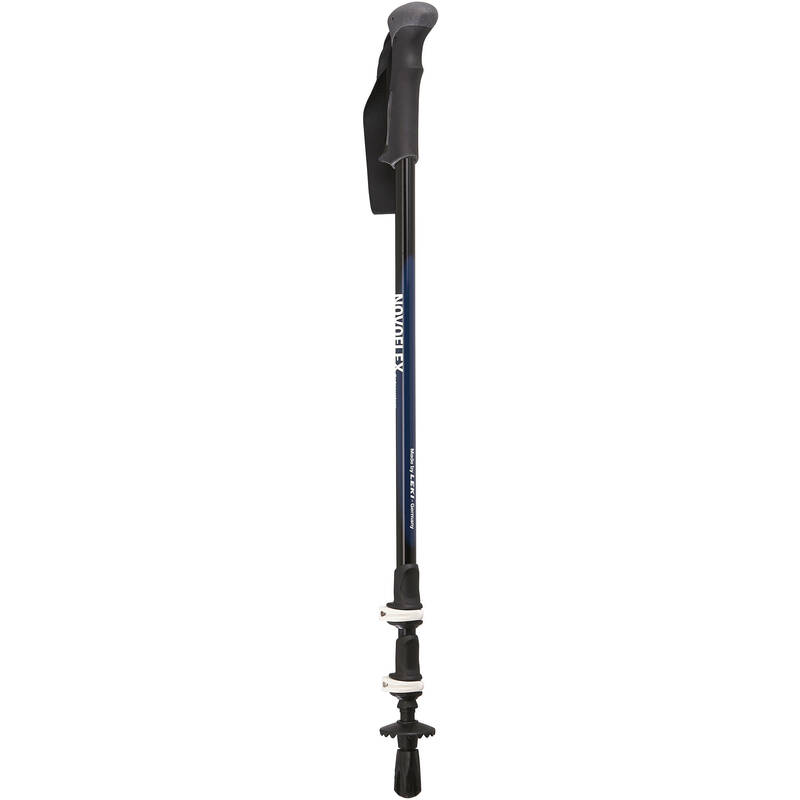 Rated 5 out of 5 by Gregory from 59 NOT 45.75 This walking stick is 59" high when fully extended, NOT 45.75." The description, which B&H took from Novoflex's webpage is incorrect (It took me over two hours and several emails to finally figure this out.). Actually, this information in the description is correct: "The second section has markings ranging from 110 to 150cm" (150cm is about 60".). This is made by Leki, a major manufacturer of trekking, skiing, and walking poles. I've had a Leki hiking pole for over 20 years and put well over 400 miles on it; Leki quality is top notch. The quick locks are a real improvement over the twist locks on my hiking pole. And I much prefer the angled grip to the foam grip on the Leki Sierra (which I also own.). Should be ideal for my hiking kit (Canon SL1, Sigma 18-250, Tamron 10-24). Probably not for my 7D mk II (with grip) and 100-400 + 1.4 converter, but I don't carry that (or my 5D mk IV) when I hike. I'll most likely use either an Area-swiss plate or a small ball head to attach the camera, which will be a bit of a hassle but easier than screwing and unscrewing the camera. Note that a 1/4 to 3/8 adapter is not provided. All in all the best all-around option for me (I do own an excellent Oben travel tripod but have found it to be too much hassle on the trail.). Hope you find this useful. At 45 maximum height is this really tall enough to be practical as a monopod?